My softened-up sweaters drying on my dining room table. I'm always learning something new. If you do not subscribe to any YouTube crochet channels, I encourage you to do so. That said, it takes time to sift through to find quality content but it is well worth the effort. A month or so ago, I got a notification about a video posted on Clare's channel, Bobwilson123, about how to soften scratchy yarn. I had no idea that scratchy yarn could be made to feel soft like other yarns. This was big news to me. I am a fan of Red Heart Super Saver. Love the colors. Love working with it. Love the durability. Love the easy care. Love the price. But . . . I hesitated to use it for baby sweaters because it wasn't as smooth to the touch as other yarns. After watching Clare's video, I did some additional research and found Emi's tutorial on her channel, Hectanooga1. Both tutorials utilized shampoo and conditioner. I decided to use a similar process but use my washing machine and fragrance free fabric softener instead of shampoo and conditioner. I washed the garments in the machine, with a small amount of detergent on delicate. Then I soaked the 100% acrylic sweaters separately in warm baths of water and 1/3 cup of fabric softener in large bowls. I periodically gently swirled the sweaters in the softener solution and made sure they stayed submerged in the liquid. After 2 hours, I drained the softener water, squeezed out the excess, and put the sweaters right back in the washing machine. I put fabric softener in the dispenser cup then ran the garments through a regular delicate cycle without detergent. I tossed them in the dryer with two fragrance free dryer sheets and a dry white bath towel on the low touch-up cycle for 7 minutes. Still slightly damp, I let the sweaters finish drying flat on a towel. 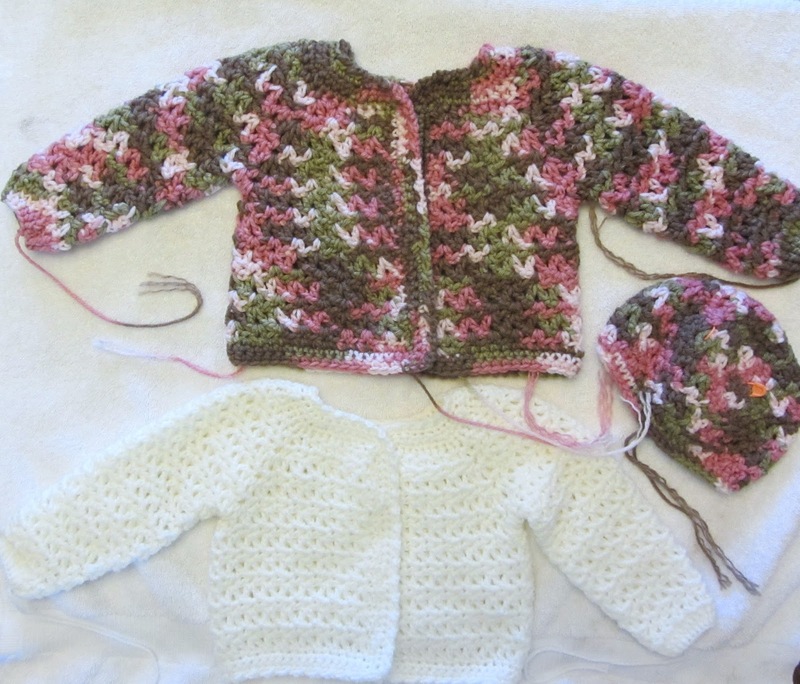 The texture of both sweaters improved significantly and were soft enough for an infant. I'm glad I went through this process prior to adding buttons. I may need to increase my button size slightly to account for the change in the yarn and how that loosened up my button holes a bit. I will definitely try the shampoo and conditioner method on my next set of sweaters but I also like the idea of using common fragrance free laundry products. Done and done. Tails woven in. Buttons sewn on. Flower motif on beanie crocheted and sewn on. And there you have it! I love the final result. I fussed over buttons for a while and ended up using four 1/2 inch shirt buttons. I added a slight shank as I was sewing them on so the buttons would pop up a bit and make buttoning easier. I searched and found the perfect flower that had a double row of five petals on Crystal's Bag-O-Day Crochet's You Tube channel. Be sure to check out Crystal's channel. Although Crystal doesn't write her patterns down, she has excellent instructional videos. sweater is top down construction, size 6-12 months. I first became fascinated with stop motion animation when I watched the Davey and Goliath series on TV as a kid. Definitely showing my age. The Wallace and Gromit movies are also familiar examples of stop motion animation art. Recently, I watched a video of a speech therapist and a young man with autism making a claymation video using an iPad. This prompted me to think about stop motion as a teaching tool for crocheters. I have often thought that when trying to follow a new pattern or starting a new unfamiliar project, it sure would be helpful to see how the parts combine to form the whole or to see the overall construction process in a video. Call me crazy. As a test, I made this quick clip showing two rounds of double crochet in the round. I decided to give a vintage pattern a try. After multiple attempts to achieve gauge, I abandoned the project. 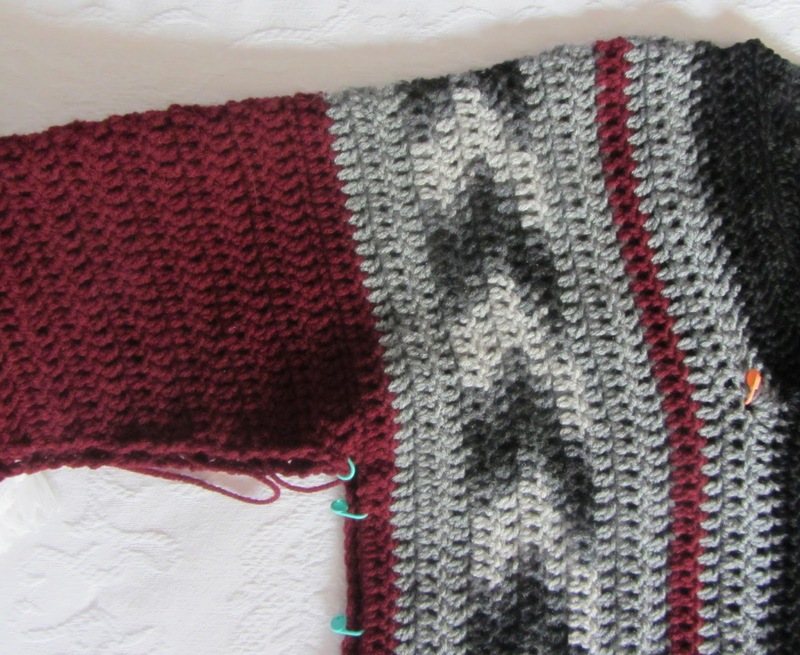 In the process, I became intrigued with side-to-side design and began searching online for a pattern for a cardigan. No freebies and I hated to put a ton of time into a pattern that ended up not fitting well. I used what I learned about side-to-side construction from the vintage pattern and took off on a tangent. Of course, I wanted a cardigan because . 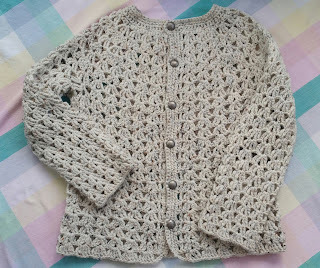 . . well, because I really love cardigans. I also wanted to bust some stash. My WIP is a far cry from the feminine pullover I started out with. I think I like it. It reminds me of a sweater my grandpa used to wear, so I guess that still makes it "vintage". My in-process "Vintage" grandpa sweater. I liked the way the yarn pooled in this section. How lucky! I figured it out! 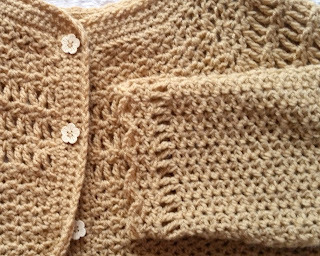 Using my original newborn sweater design, I problem-solved how to alter the neck foundation, stitch pattern, and hook size to create a cozy cardigan for infants size 6 to 12 months. I used the size charts here to guide me. Now, I just need the right buttons. 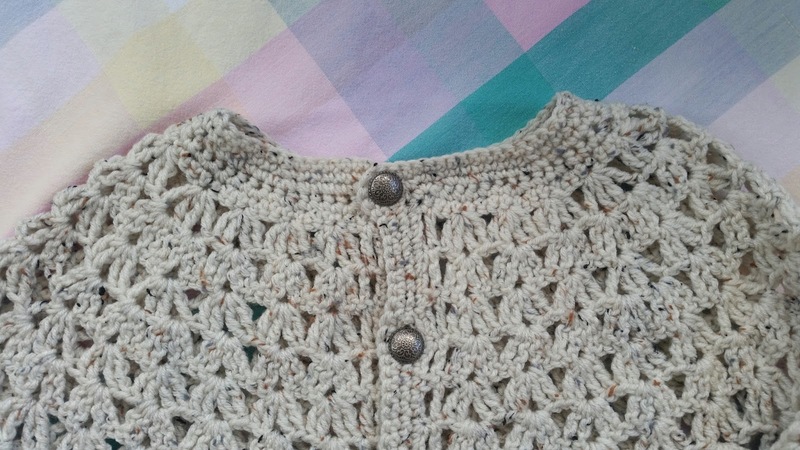 The design is seamless or top-down like my adult sweaters I make. As per my usual process, the beanie design came to mind before the finishing on the sweater. In fact, I was re-working a sleeve cuff and decided to attempt to make a hat in a matching stitch pattern starting at the crown. The beanie literally flew off my hook and hands so fast, I didn't take the time to take notes. 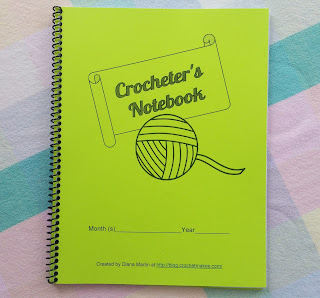 I must force myself to use my Crocheter's Notebook but it is hard when I am in the crochet zone. with Vanna's Choice in grey marble. 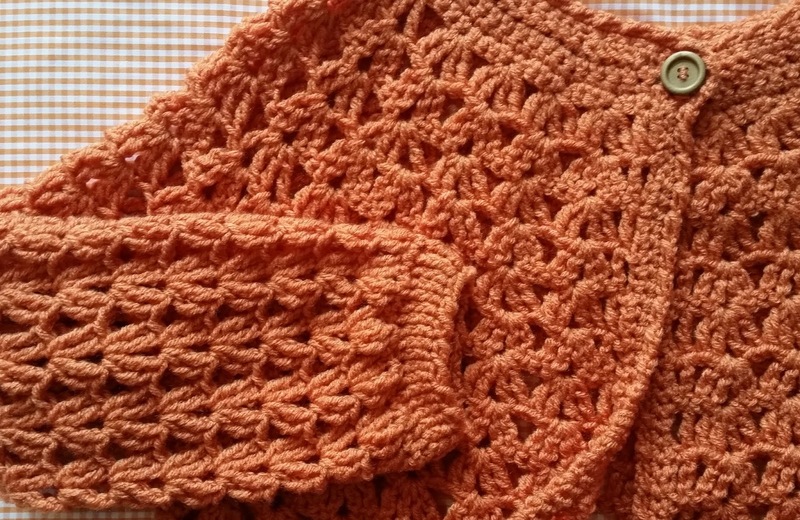 So why would I spend so much time developing crochet patterns? Truth is, I don't know why. The problem solving feels more therapeutic than frustrating. I have control. My thinking. My decisions. My time. I have recently been told by many friends that I should think about making a business out of my crochet passion. Maybe. Putting my patterns on paper is a goal but why do it? Does it make sense to put so much effort into something, putting yourself out there as a business, and not worry about turning a profit? Doesn't seem like a very good business plan. For now, I am learning what I like as a consumer of crochet related products. I know I no longer have patience for blogs and sites filled with pop-ups and ads. 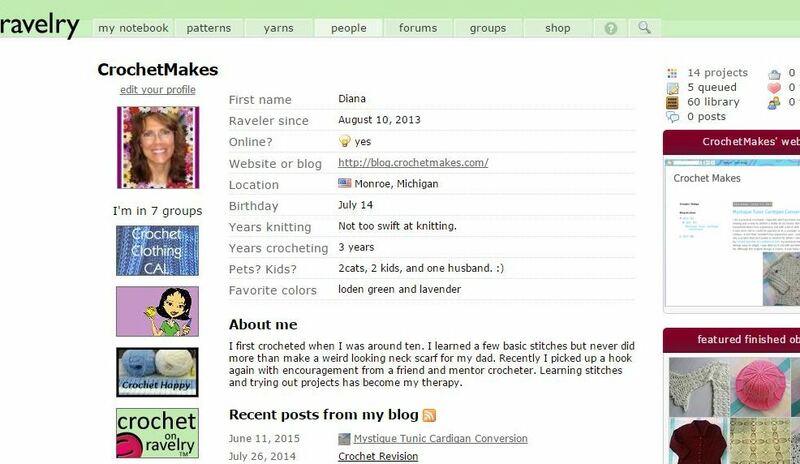 I like Face Book, Google+ pages related to crochet as well as Pinterest boards. And Ravelry is the best tool out there for identifying good patterns. I am also willing to watch ads on YouTube prior to viewing tutorials from channels I like. My primary crochet related expenditures are yarn, hooks, and tools. I also purchase some patterns and magazines. I use the public library to check out crochet books. Eventually I will purchase some books but will wait for sales or an Amazon gift card. I suppose that sounds cheap. 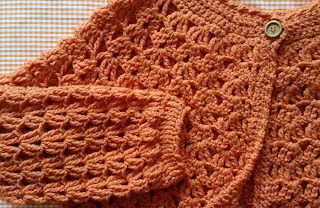 Crochet is not a cheap hobby and I know I am not the only crocheter who looks for bargains. That said, I strive to give credit where credit is due. If I am inspired by another pattern or tutorial, I indicate that on Ravelry and on my blog. It takes time to link to the blogs and Pinterest boards of others but I do the best I can to make that effort. I like the advice from Link with Love regarding the sharing intellectual property. 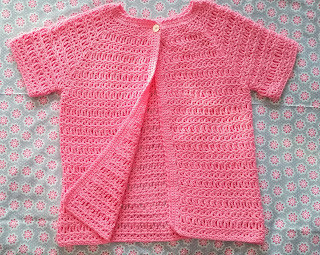 cardigan. I really need to work through all the directions and GET IT ON PAPER! I was doing so well. What was it that distracted me? I had a good run finishing and frogging my pile of abandoned sweaters. I found three more nearly complete ones in a box in my closet. 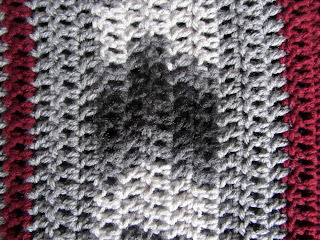 I was in the process of re-working the bottom of one of them, a very cool motif pull-over, when I needed a break. 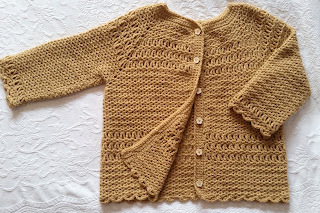 I was working on uploading some projects to Ravelry and casually did a search on cardigan sweaters. As I scrolled through the photos, the baby sweaters caught my attention. So little. So sweet. So cozy. Creating a baby sweater pattern has been on my "plan to do someday" list for a while. 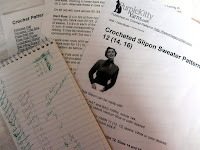 I grabbed one of my frogged balls of Simply Soft, an H hook, and sketched a neck foundation in my Crocheter's Notebook. My little break turned into a late night crochet session and ended with the prototype sweater below. I want to add pearl shank buttons, about 5/8" I'd say. The sleeves may be a bit long so I will have to match it up to other sweaters or see if I can research sleeve lengths by size. 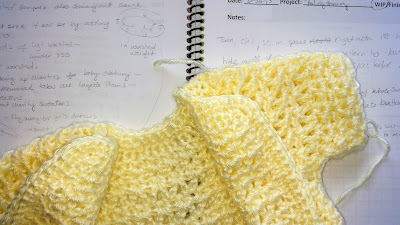 Of course, once the prototype for a worsted weight sweater was almost done, I was already mentally working out the neck foundation for a baby cardigan made in light worsted weight yarn. Here I go again! Here is a WIP using a 3 weight yarn. Now that is YELLOW! 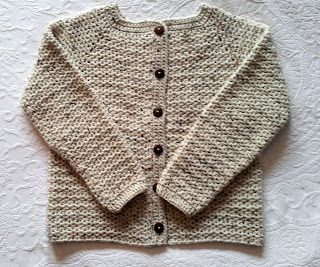 After creating my baby cardigan prototype, I searched for size charts and found several. See the links below. According to the charts, my prototype is a size newborn. The arms ended up the perfect length. My Crocheter's Notebook has been a great tool to collect my revision process as I work through the cardigan design using different yarn weights, hook sizes, and stitch patterns to construct the sizes I want. My goal is to develop three size ranges in worsted (4), light worsted (3), and light (2) yarns. It will require hours and hours or work. Different yarns and yarn weights produce a variety of results. 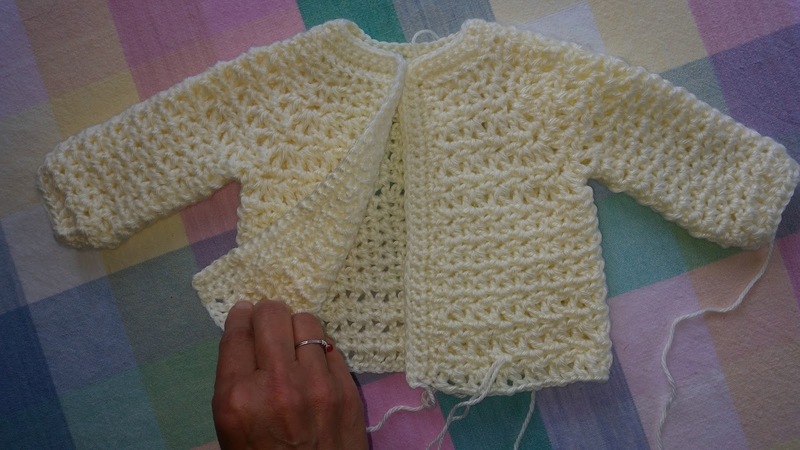 The basic pattern and process can remain similar but it is the fine tuning that allows for the pattern to be used across multiple sizes and yarn weights. Fit, feel, and details are important to me and I am willing to fiddle to get what I want. This is the fifth sweater in my pile of unfinished projects. 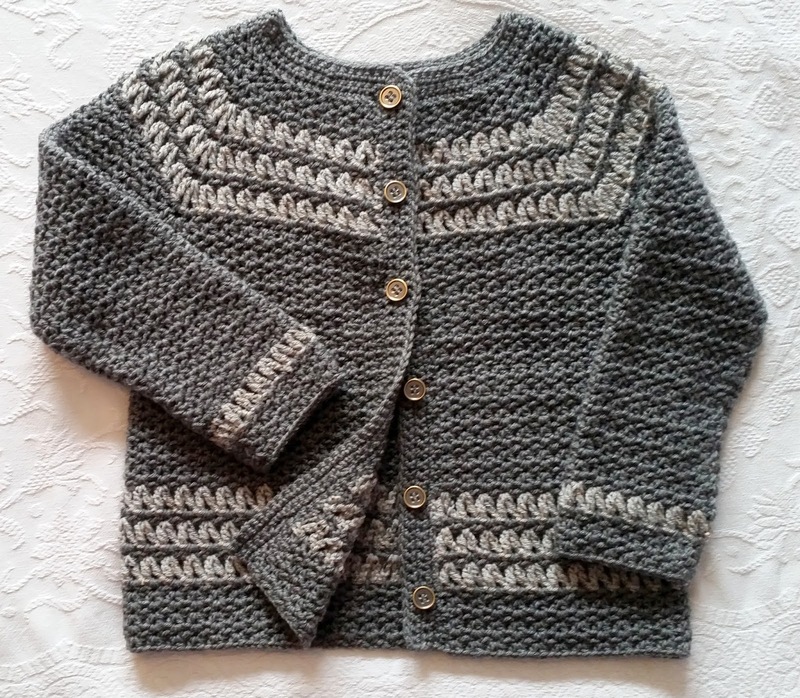 This cardigan is a spin-off of Lorene Eppolite's Mystique Tunic pattern. As I have said before, this is a great free pattern. 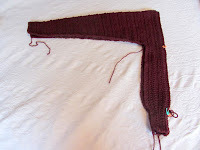 When I tried on what I had already finished, I discovered that the sleeves and overall length were too long. 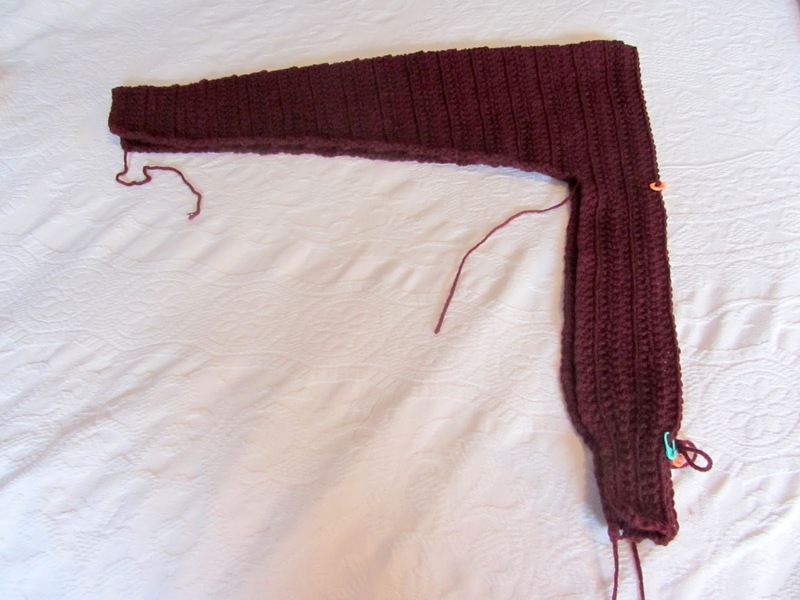 I frogged four rows on each sleeve then five rows off the length. I re-worked the button band and added a modified crab stitch to the front loops of the button band and neck. I also added cuffs to the sleeves using three rounds of front post half-double crochet stitches. 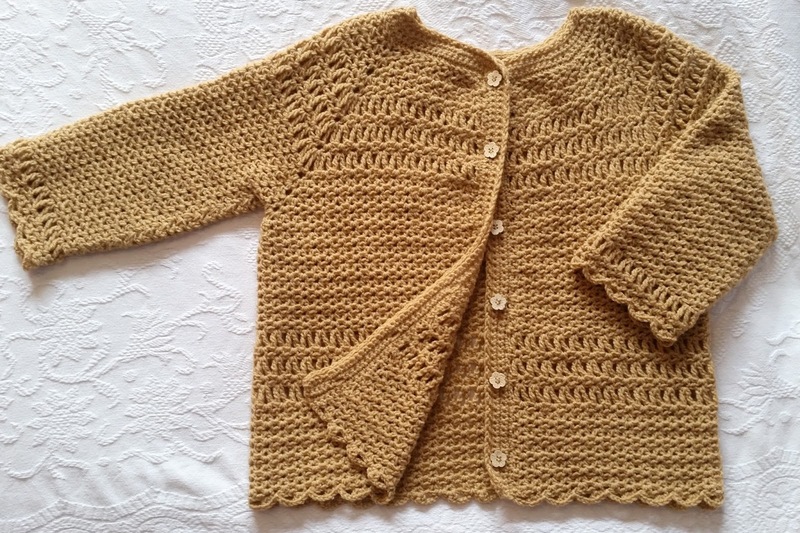 I added a wooden button at the top to complete my pumpkin fly-away cardigan. I love the end result. The armholes are a bit deep but it isn't terribly noticeable. This will be a fun sweater to wear in the fall. Worked with Red Heart Super Saver in pumpkin with I hook. background will be used to make a blouse--hopefully. 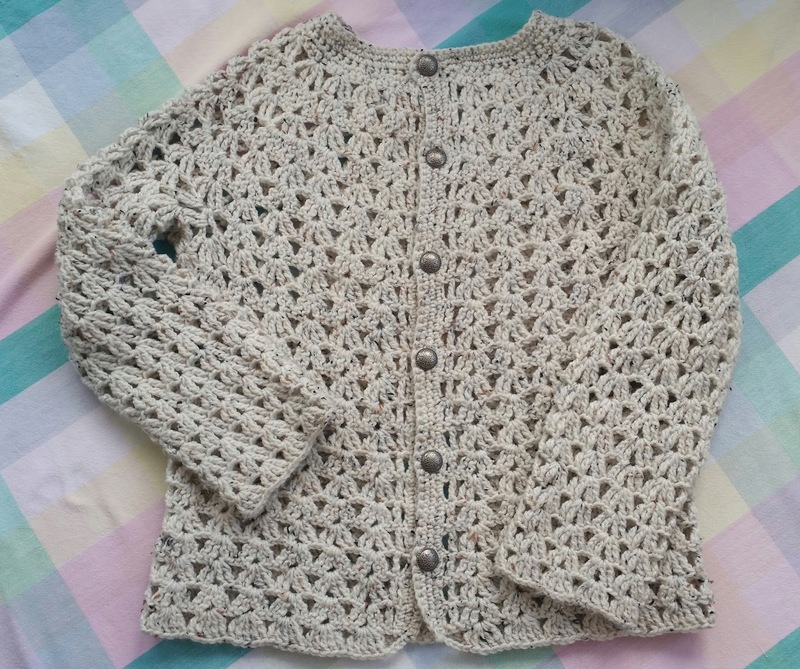 This is the fourth post in a series focused on completing my pile of almost finished sweaters. I didn't have to re-work sleeves or add rows like I did with the second and third sweaters. 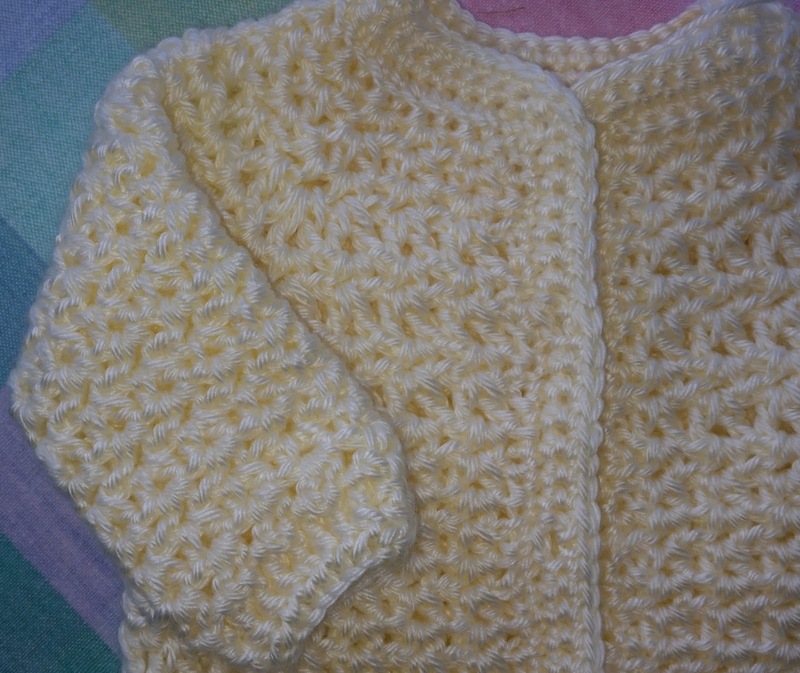 And even with all the tails from changing yarns, this sweater didn't take as long to finish up as I had anticipated. The button holes were a tad uneven but again, I can see the errors but they are not terribly obvious once I am wearing it. No handmade garment is perfect, including this warm garment. Small crochet mistakes are less important to me than fit. I have continued to tweak the fit with every sweater I construct using this design. buttons are from Hobby Lobby. This post is the third in a series devoted to finishing my pile of nearly done sweaters. The first and second completed sweaters are already in my closet. After I tried on this toasty coat-like cardigan, I remembered why I stalled with the final clean-up. One sleeve was longer than the other. Oh, Lord. Because this is an original design, or maybe that is an excuse, I wasn't sure how the taper rows on the sleeves would turn out until after I completed an arm and tried it on. 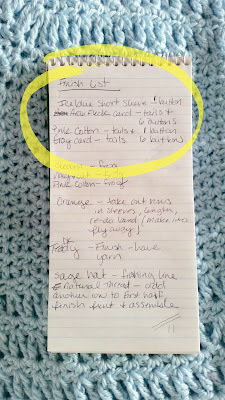 I re-crocheted so many times that I probably lost track of where I was and my notes were all over the place. I ended up removing four rows and re-working the cuff and called it good. When I tried it on for the millionth time, the imperfections, although noticeable to me, were not glaring enough to keep me from completing and wearing it. In fact, I love the thick blanket texture as well as the fit. original design that I haven't yet put on paper. Whew! This thing is warm! This post is the second devoted to finally finishing my pile of almost done sweaters. This softy was not as quick and easy to complete as the first. I had to add several rows to the bottom and form the button band. I began hemming and hawing over whether I should make it a fly away or button down. Indecision was eating up my motivation. I went with the more time consuming choice and of course, once I committed to a button down sweater then I had to ponder a border stitch for the bottom and the sleeves. I ended up creating an original border after a half an hour of searching for border stitch designs. I needed to quit thinking so much and just get it done. The final results were worth the extra effort. And best of all, it fits beautifully. 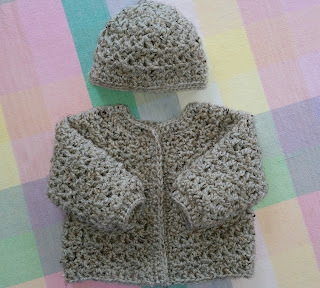 baby yarn in Teddy. I used a G hook. During the last several days I have been on a mission to organize my crochet chaos. One of the first things I did was to create a place to collect my notes on projects. I researched various resources online then decided that creating my own made more sense for me. I also wanted to keep track of information I would need when I uploaded my projects to Raverly. Initially I had envisioned making at least four, one for a quarter of a year, all different colors, partnered with color coordinating folders for printed patterns and swatches. Part of the inspiration for my notebook came from years of using writer's notebooks with students at school. 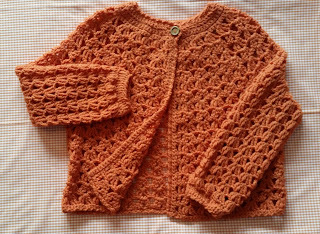 For me, crafting a sweater and wearing it is like publishing a piece of writing. 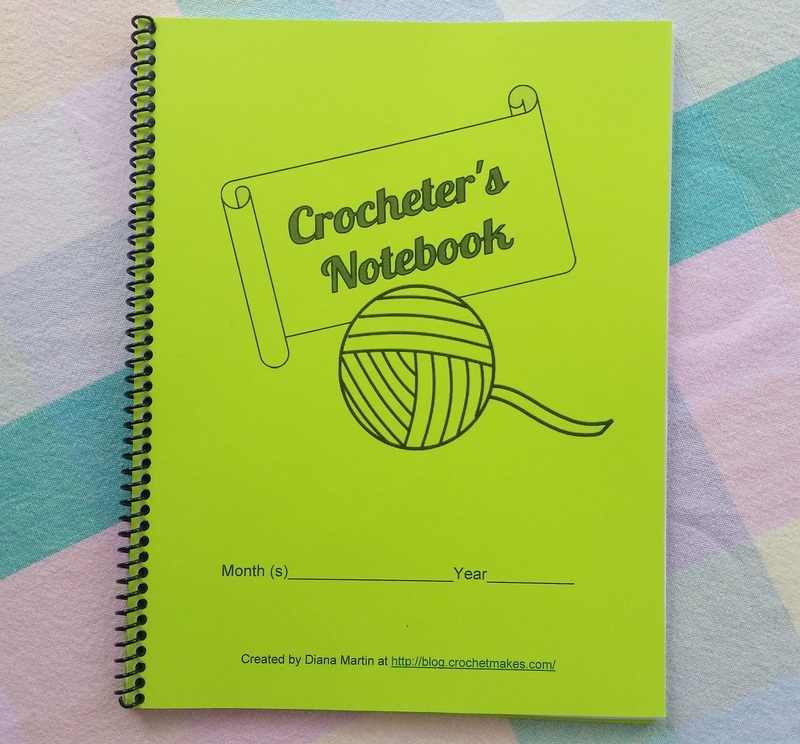 The PDF's of the Crocheter's Notebook are available here. Well that was easy. Just a button. The right button. That is all it needed. The problem is that I'm not sure I have the right button. Luckily, buttons are easy to change. The sweater is a delicious bubblegum pink, almost a hot pink. I don't remember if the sweater was quick to work or not. I made it a couple of months ago. 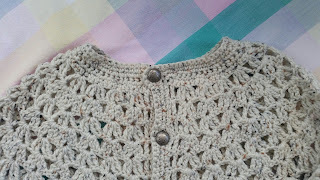 It was the last in a string of sweaters I had made early this spring using my own designs. One of my goals was to write detailed directions or maybe even create a tutorial. 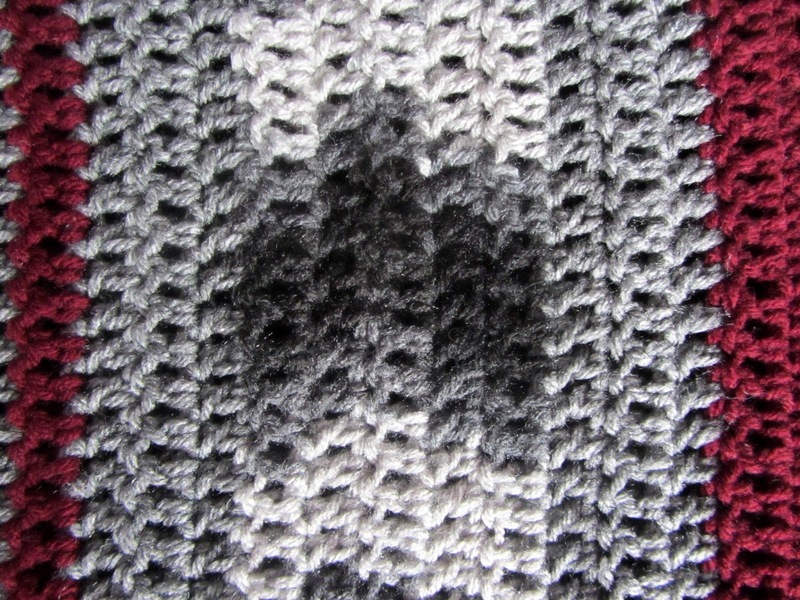 The stitch pattern is not complicated. It was basically alternating rows of treble crochet "v" stitches and half-double crochet "v" stitches. Instead of a finish-up Friday, I need a finish-up week--or two. 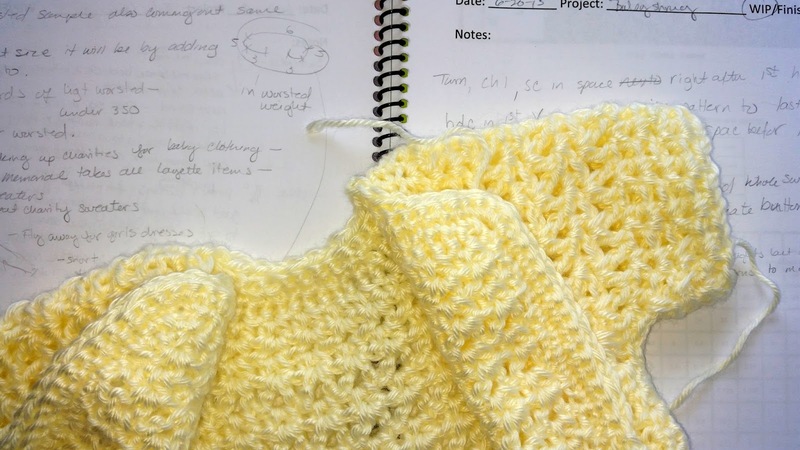 I started to inventory my unfinished projects (stalling) and I began to get overwhelmed. I decided to start off with the sweaters. 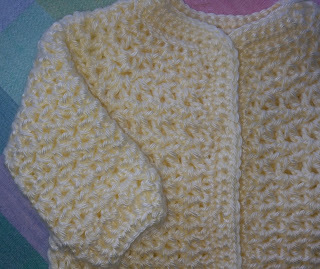 I had four cardigans that only needed the tails sewn in and buttons attached. I vaguely remember wanting to wait for sales on buttons. A legitimate excuse--still an excuse. Since Hobby Lobby had buttons on sale, now was the time. I gave myself a deadline. All sweaters requiring buttons had to be finished by Friday so I could take advantage of the sale. Time to brew up the coffee, break out the yarn needle, and get going. My latest excuse for not cleaning up and organizing all of my yarn, notions, patterns, and projects is . . . well, I've run out of excuses. My stuff is pretty much a mess and I have several almost finished projects. Some crocheters go on a yarn diet or a yarn ban, where they promise themselves and those they love that they aren't going to buy another ball of yarn until they used a large portion of what they own. Clare at Bobwilson123 admits to her own addiction. Having a large yarn stash requires space. I have my daughter's old bedroom with a walk-in closet and I still have a tangled mess. For shame. So, as I thought about mapping out how I would attack my mess (more stalling), I decided to start with organizing my notes and patterns. 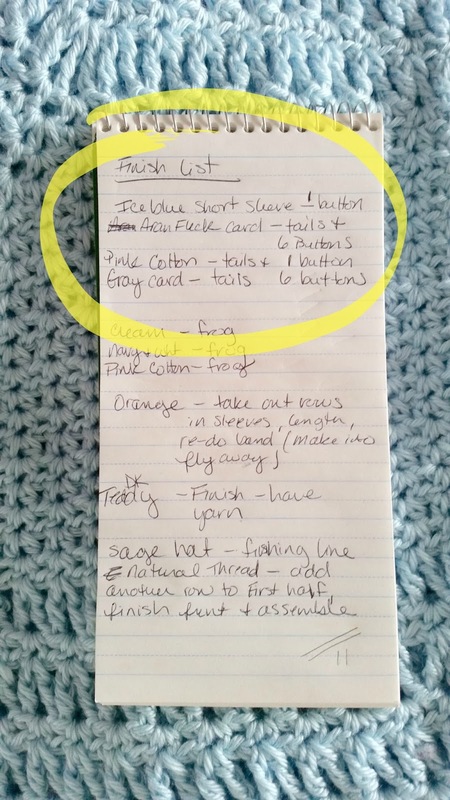 Even though I love technology and apps, I still like to write notes by hand on the printed pattern or in a notebook or piece of paper as I crochet. It's quicker. I can hold my work in my left hand and write with the other. My pencil stays handy tucked behind my ear. The problem with this system is that I have a bunch of random notebooks and scraps of paper with notes. I am growing a nice library of patterns in Google Drive, which is an excellent tool, but I often take my projects on the road with me. Keeping a physical notebook is easier for the car. Below are pdf's of pages I plan to put in my new notebook. Now, I need to get to Staples to get my books printed. 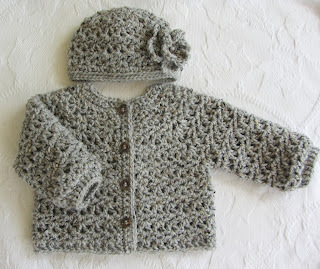 For the last two days I have spent hours uploading many of my finished crochet projects onto Ravelry. I have been a lurking member of Ravelry for about two years. I have used the sight continuously to find patterns that other crocheters have worked or to research yarns. 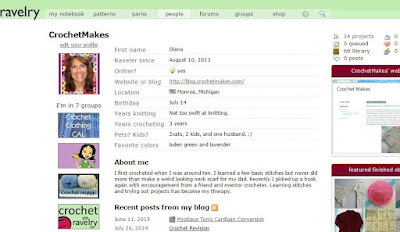 Ravelry has been a source of both information and inspiration. But what makes Ravelry powerful is the participation of its members to generously share their talents and thinking for all. The process of uploading past projects has given me a sense of how my skills have grown and how my interests have evolved over time. 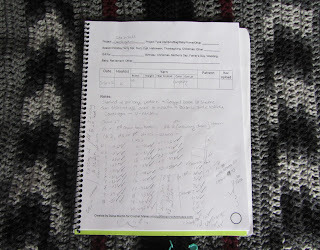 Seeing the projects in my Ravelry notebook has also sparked future goals. I am a practical crocheter. I typically don't purchase expensive yarn. When I was a youngster, home sewing was a way to stretch a dollar at our house. 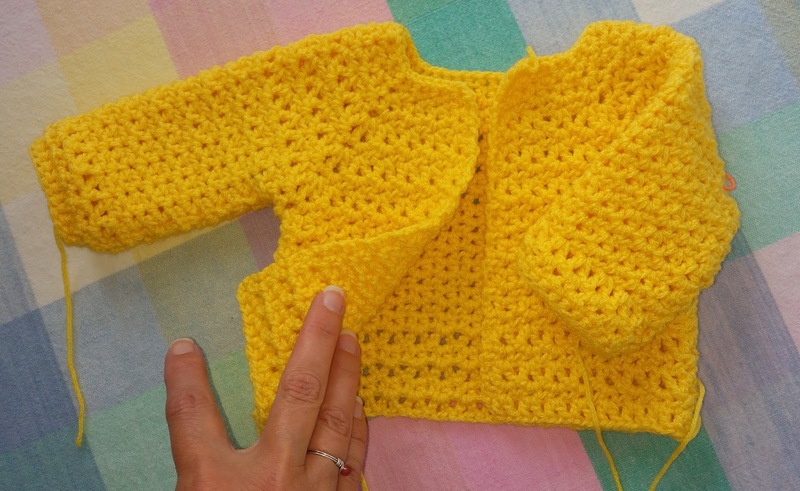 Not only was making our own clothing and household items less expensive, but with a bit of skill, what we made lasted and could be used until it was worn out or could be passed on to a younger cousin. As an adult living and working in the 21st century, it isn't that I wouldn't buy expensive yarn, I just worry that I will invest a lot of time and money into a project that isn't useful or doesn't fit. 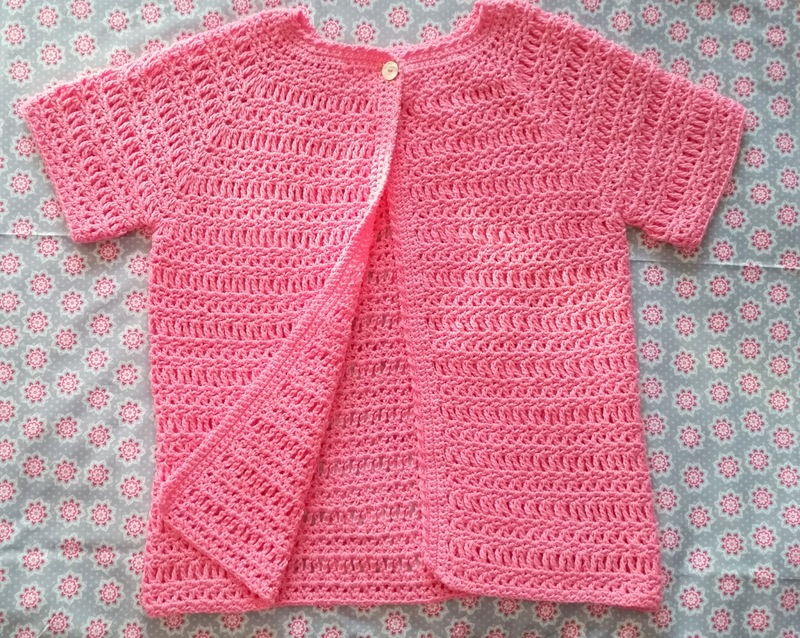 When I came across the Mystique Tunic pattern designed by Lorene Eppolite at cre8tioncrochet, my practical maker heart leaped. Not only was the top-down design easy to adapt, I was able try it out with worsted weight yarn in my stash. I have made three so far. 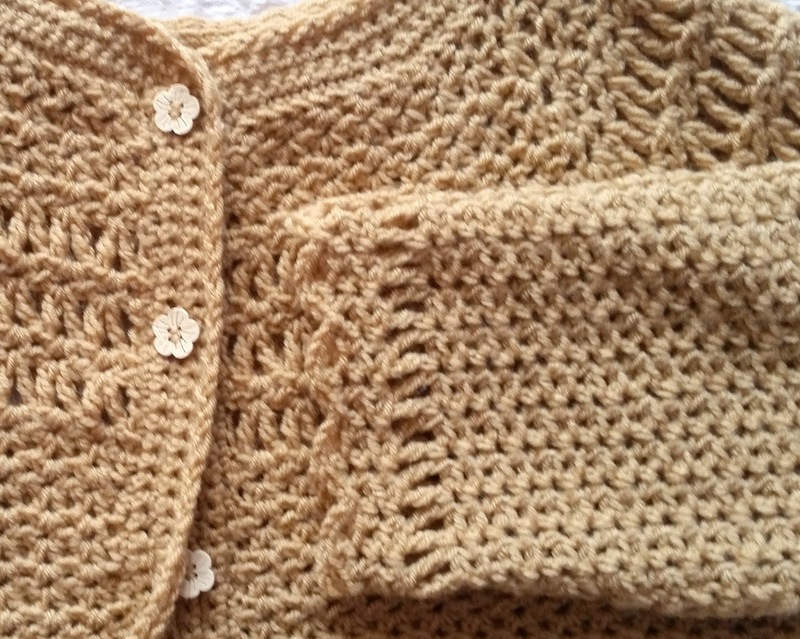 Although the original design is a tunic, it was fairly easy to convert it to a cardigan. cardigan a ton over the winter.